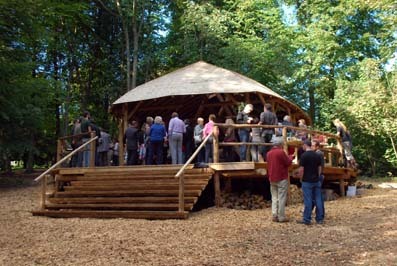 The Woodland Hall was designed and built in the summer of 2010 by Ben Law of Woodland House fame and funded by the kind generosity of the Mamie Mollan Trust. All of the wood, and most of the materials, were sourced from within a mile of The Sustainability Centre. The main structure uses softwoods from our woodland that have little or no commercial value and the roof is made from sawn western red cedar shingles. The Woodland Hall is partially earth-sheltered with cordwood walls to the north within which is a rumsford clay fireplace. The remainder is be open-sided, with canvas roll-down panels, which can be lowered to make the space cosy or raised to enjoy the beautiful woodland setting. The hall is furnished with folding tables and chairs, and circular benches made by final year coppice apprentice Peter Murray. In accordance with our ethos, the building of the Woodland Hall has provided a number of educational opportunities for adults, children, and school groups including 4 five-week building apprenticeships and clay inspired activities. Books published by Permanent Publications tell the story of roundwood timber framing and feature our building too. Copies are available online from Permanent Publications or in our shop.